Arguably the spiritual home of cycling, Italy’s varied landscape, climate and cycling culture combine to produce an ideal backdrop for a 3.5 day coast to coast ride. Our Mare a Mare route crosses Italy from Pesaro (east coast) to Livorno (west coast), incorporating Giro d’Italia climbs, Roman Roads and famous Chianti vineyards. Highlights include riding through five areas of Natural Beauty and multiple route options per day, meaning the ride is suitable for all standards of cyclist. We fly into Bologna airport and transfer to Pesaro and our start hotel. Lunch is served on arrival, before dividing into our guided groups and setting out on a warm up loop to get the legs going! We ride in a south westerly direction as we leave the province of Marche and head to Umbria. On route we pass through the stunning Roman road along the Furlo Gorge, carved out of the rock and following the River Candigliano with sheer rock faces looming above us. Today is the Giro climb for those that dare. It’s a beautiful climb rewarding you with views as far as the eye can see! Umbria is sometimes known as the younger sister to Tuscany but today as we wind our way through remote roads, tiny hamlets and climb to the top of hillside villages, we will find it has a charm and life all of its own. 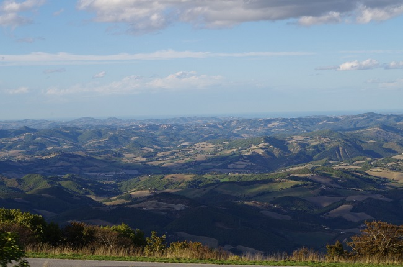 The high mountain road that takes us from Umbria and into Tuscany looks down on Lago Trasimeno in the distance. As we climb ever higher we come over the hill to the famous medieval village of Cortona where we enjoy our restaurant lunch overlooking the town square. The reward for climbing all this way is the descent into what will be the setting sun and the stunning views of Siena in the distance getting ever closer. Our last day and we find out the west coast of Italy is very hilly! Our destination is Livorno built several centuries ago with a rich heritage in global trade. It lies nestled on the west side of the Parco Monte Livornese on the edge of the Mediterranean. 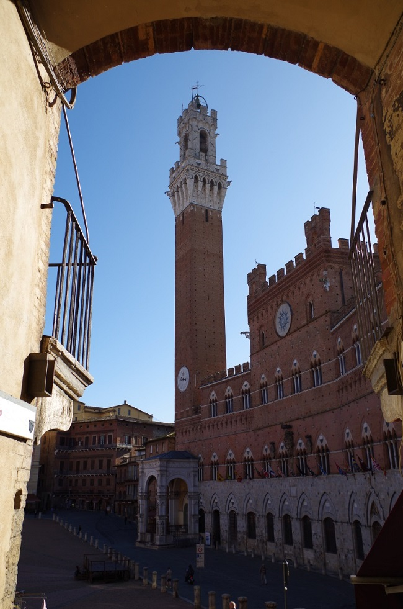 As if spending the night in Siena was not enough, our 4th day is the Tuscany from the photos and guidebooks and the reason we are all here. The hilltop villages astound, the medieval towers of San Gimignano reach for the skies, and you can almost taste the Chianti as you cycle past the vineyards. As the 3 different route options converge on Livorno, we celebrate right on the edge of the Mediterranean on the Terrazza Mascagni, Livorno’s jewel of a Piazza overhanging the sea. Celebration drinks overlooking the waves before dinner. Day 5 – Day of leisure! Enjoy the sights and sounds of Livorno before transferring to Pisa airport and travelling home.